This beautiful picture of Haiti is not newsworthy, It does not sell newspapers! Have ever seen a beautiful picture on the internet and wondered: where is this place? Well, this is beautiful image is Haiti... It I didn't tell you, would you have guessed it? Lately we associate Haiti with pictures of people protesting in the streets, tires burning, misery and trash. Unfortunately for Haiti, this picture is not newsworthy! Our organization is based in the mountains in the Cabaret region of Haiti. There is only one road in unless it rains and then we have to off road. It is one the most beautiful areas of Haiti even though it is 85% deforested and we are constantly challenged by sinkholes. The beauty of Haiti is in her people. 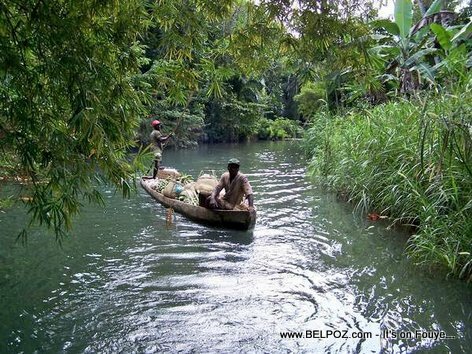 wow, I remember when I used to jump in that beautiful Riviere Of Baraderes and came back with a mango in my mouth.